Israeli demographics have always made for a chaotic political culture. While to the outside world, it's a nation of Jews, internally it's a nation of Russians, Anglos, native Sabras, Yemenites, Syrians, Persians and a hundred others. Even the smallest group has its compartmentalized identities: the delicate differences between immigrants from a single country but different towns, the countless distinctions among its religious communities in their own way are united and disunited. The politics of such a country encompass too many groups to list. There are the 19th Century Hungarian immigrants who came in preparation for the coming of the Messiah and have resented all other Jews who came before them or after them as usurpers: these form much of the Neturei Karta, a fanatical group that rejects the State of Israel. There were the German Jews who brought with them an equally fanatical efficiency, building chicken processing plants that were as clean as operating tables. There are the truly old Jerusalemites and the immigrants who have just arrived and are already learning to resent the new immigrants who get off the plane and expect to have everything handed to them on a silver platter. Israeli politics are born out of the chaos of the nation's demographics. Its Knesset is a room where fanatical atheists and the fanatical religious, urbanites and hill-dwellers, representatives of Russian and Middle Eastern Jews, settlers and Arabs, feminists and patriarchs, socialists and capitalists, scream at each other for hours, not always for the reasons you expect, and do nothing constructive. That makes Israeli politics a lot like everyone else's politics, but it has its unique features as well. The Israeli left is one of the few socialist movements in the First World to lose power because of immigration. Around the same time that Western immigration policies were being tuned to bring in populations with less investment in their new nations, new Israeli immigrants were more patriotic and nationalistic. To understand the effect, imagine that the United States today was being flooded, not with the morass of Mexicans, Haitians, Pakistanis and Kenyans, but with Irish and Italian immigrants who had no hesitation about flying the Stars and Stripes or identifying with their new country. Russian and Middle-Eastern Jews who arrived in Israel (and the United States) were more likely to be conservative and to regard the left's growing preoccupation with appeasing terrorists with suspicion. And in a two party system, their votes would have prevented the left from ever doing more than having a few token elected members denounce the state on the floor of the Knesset before slinking back to their cafes. The Israeli left was never particularly fond of immigration to Israel. Their ideal from the start was a land settled by a cadre of young men and women, trained in their schools and indoctrinated with their ideology. British restrictions of Jewish immigration were not nearly as troubling to them as they were to the right. Israel, as they saw it, would be for a small chosen elite, a socialist enterprise that the vast majority of European Jews did not have the skills or temperament to participate in. Their vision of a country consisting of collective farms and a few state-operated enterprises under a single union was ended by the Holocaust. While the right took the lead in smuggling Jews into Israel, particularly in the fading days of the war, the left had still not come to grips with a country overrun being overrun by the kind of people they had wanted to leave behind. The left seized power early on and, with the Altalena massacre demonstrated that it was entirely willing to kill to maintain that power. But it couldn't maintain it against the press of the ballot box. The system of patronage that it implemented was meant to marginalize the right, as well as those outside its club, the Holocaust survivors and Middle Eastern Jews, who were meant to play secondary roles in the life of the country. One of the peculiarities of Israeli politics was that its left was nativist while its right took on the role of the defenders of marginalized minorities. A role reversal that was made possible because, while most Western leftist parties viewed immigration as a way to destabilize the nativist vote, the Israeli left saw immigrants as destabilizing their existing power base. Begin's campaign against German reparations, which culminated in the ugly scene of tear gas being used against protesting Holocaust survivors, was a fundamental political moment. It was the type of the moment that the left would have loved to have owned. As did a speech by an Israeli entertainer at a Labor election rally in which he used a slur to refer to Middle Eastern Jews while linking them to the right, which allowed Begin to deliver a widely publicized statement of solidarity with them. The modern Israeli left is an oddball fusion of Tel Aviv hipsters and the angry old men who resent the Orthodox, the Russians and the Middle Eastern Jews who upset their ideal society. The hipsters write up manifestos which call for the left to reach out to the Orthodox, the Russian and Middle Eastern Jews, but they have no idea how to go about doing it. The left had its chance and blew it. That's not to say that the left isn't willing to capitalize on immigrants. Its new cause is fighting for migrant workers, mainly the African equivalent of Mexican illegal aliens, who commit most of the same crimes. The Israeli left has finally figured out that it needs the right kind of immigrants. The kind who don't care about the country but are just there for social benefits. But the left had those immigrants all along. The dirty little secret of the left is that it is heavily dependent on Muslim votes. A sizable number of those votes are paid for, not just in the usual way that rewards are doled out, but paid for in a cash on the barrel sort of way. The more the left began to lose touch with Jewish voters, the more it became dependent on Arab voters. From internal party primaries to national elections, the left would not exist without the Muslim vote. The inability of the left to connect with mainstream Israeli voters has led it to become more and more dependent on disguises, from third parties to the disintegration of Labor and the reemergence of much of its cadre in the Kadima Party, which was until recently the political opposition. The Israeli left today does not exist as a movement, so much as it exists as a set of policies that are implemented by the bureaucracy, invested in an activist Supreme Court and that passes into the DNA of parties like Kadima. Its ventures appear as social protests, which it also disguises as populist rallies that are supposedly in no way connected to it, even though they are organized by its NGO's. The old Israeli left did not need foreign-funded NGO's to conduct its political activity, but the new Israeli left is beginning to take on the air of a foreign-funded venture. Like the American Communist Party in the 1950's, the Israeli left is underground, emerging in front groups and policy programs, but not even making a serious effort to get the Israeli public to accept it as a movement. The political parties associated with it are a laughingstock and its grip on power is invisible, but still ruthless. The two bugbears of Israeli demographics are also its two most controversial populations, Arabs and Orthodox Jews. Both groups have a high fertility rate and a mixed view of participating in the state. And that combination makes for some sharp edged studies and worrisome statistics. The right has been concerned about Arab demographics, and the left with Orthodox demographics. While even non-Orthodox Israelis have a high birth rate compared to most of the West, it's not enough to compete with either group. Straight-line long-term projections paint the future as caught between an Arab and Orthodox majority, but the alarm bells are somewhat cynical. The left has used the general disinterest of Arab and Orthodox votes to stay in power. It made deals with both Arab and Orthodox leaders, employing them as a blank voter base for a blank check in its own politics. Barring the National Religious, the Orthodox have mainly stayed disinterested, and the Shas Party has even successfully funneled away nationalist votes into its own community party built on the model of its Ashkenazi Haredi counterparts. But the Arabs have not stayed disinterested. The Israeli Arab status quo was destabilized by the left's own last ditch effort to sideline the right by redefining Israel. Its Peace Process was poorly thought out and poorly implemented. And it made its grip on power even more unsustainable than it had been before, by making it easy for the right to present itself as the national security party. But it also encouraged Israeli Arab leaders to believe that the State of Israel might be toppling and to begin acting that way, effectively radicalizing them. The right's efforts to solve Arab demographics with unilateral disengagements and land swaps are equally misguided, not only because the demographics are overblown, but because the problem has not actually been solved by walking away from it. All that does is lead Israel back to a 1948 ghetto surrounded by hostile enemies whose welfare the world holds it responsible for and whose attacks cannot be meaningfully ended without taking control of the land that they are operating from. Israel is running out of immigrants, Having exhausted Russia and the Middle East, it can only draw from the remaining reservoirs in Europe and the Americas. But that reservoir is also not unlimited. And drawing back the large numbers of Israelis who have immigrated would require reforming the bureaucracy enough to make running a small business a lot easier than it is. Nor are migrant workers any kind of solution, unless Israel wants to go down the same road as Europe. The situation in Tel Aviv should be a wake-up call that Israel is not in any way immune from the same maladies and that enough migrants will quickly become a social problem of an entirely different class than any immigrant problem that has come before. The Lost Tribe variations that involve zeroing in on some population that can be claimed as one of the lost tribes is the same thing. Israel has done everything possible to increase its birth rate, and its high birth rate is proof of that, but like most modern countries it is never going to be able to compete with the birth rate of patriarchal societies and subcultures. But it only truly has to compete with the Arab side. Israel is lucky to have the Orthodox, just as America is lucky to have the Mormons. A country cannot survive without a high native birth rate and those high birth rates are found among traditionalists who have not gotten on board the modernist express train to demographic depletion. Even a country which does not accept immigrants, such as Japan, is struggling to deal with its demographic depletion. Countries which have immigrants or local populations with high birth rates have no future without traditionalist birth rates on their side. A Haredi majority will take some political adjustment, but the left's alarmism about turning into Iran is something even they know to be false. The Haredi camp could not unite enough to win elections in Jerusalem. It spends half its time fighting internal battles, which is something the left should be able to relate to. Nor does it have any interest in running the country as a whole. It would not know what to do with the country if it had it. Its cultural DNA is built to be a minority in a country run by other people. For it to embrace a national identity, it would have to become more like the Dati Leumi, the National Religious, who have their own sizable birth rate. All this will mean that Israel will not look very much like the socialist utopia that the left imagined. But it already doesn't. It is a country already dominated by the groups that the left does not like. The collective farms are turning into conventional farms. The privatization of state-owned industries has led to major economic changes. The accommodation of a society formed by traditionalist birth rates will be another of those changes. "The Israeli left is one of the few socialist movements in the First World to lose power because of immigration. Around the same time that Western immigration policies were being tuned to bring in populations with less investment in their new nations, new Israeli immigrants were more patriotic and nationalistic." Too bad the American Jewry has been of paramount importance in flooding the country with Third World low IQ immigrants. In 50% of your essays you criticize Islam and Muslims (and rightly so); in the other 50% of them you criticize liberals and the Left (and rightly so too). But what puzzles me is that you write about the American Left in totally vague terms, as if you were not interested in spilling the beans about who the concrete, real-life leftists were. The absolutely desproportional role American Jews have played in leftist politics and policies in this country is something you don´t dare to mention in your texts. Fortunately for Israel, the Jews living there put the interests of their country first -- unlike Jews in the USA,TO WHOM WE OWE THE 1965 IMIGRATION ACT. Hadn't realized that Ted Kennedy was a Jew. The concrete real-life leftists... are leftists. They have no race or religion because they've chosen the left as their race and religion. There are plenty of prominent figures among their ranks of Jewish and non-Jewish origin. If the left was some Jewish project, then it wouldn't have a fraction of the influence or power that it does. The real problem is that the left has the backing of Western elites. It was on the rise before Jews even had civil rights. Jews have played a disproportionate role on the left... and on the right. Which is fun fodder for conspiracy theorists, but is inevitable for talented people. Jews are more supportive of immigration than average. So are Catholics. So is the Mormon Church. The Jews living in Israel don't put their country first, no more than Americans as a whole put their country first or the French put their country first. Israel has an active left that promotes undermining their country and it has a weak right. It's no different in that way than the rest of the West. "Hadn't realized that Ted Kennedy was a Jew." You are far smarter than that, Mr. Greenfield. Kennedy was the visible face of the disastrous 1965 Immigration Act, just like Bush was the visible face of the disastrous invasion of Iraq, but in both cases, who were the REAL PEOPLE pulling the strings behind these folks? Do the names EMANUEL CELLAR AND PAUL WOLFOWITZ ring a bell, Mr. Greenfield? You are one of the most talented and well informed minds on the blogosphere these days, Mr. Greenfield and you dont need a nobody like me to tell you this. For years I have been a regular reader of your blog and I admire your work. But as a right wing Jew, you find yourself in the awkard position of having to see no evil, talk no evil of your own folk. It is obvious truth that Hollywood and the Media in this country are unashamedly liberal. But who the hell is in charge of them? Judging from your essays, it is this strange human entity called "liberals". "The Jewish vote is not a single entity. There is no monolithic Jewish vote, because there is no monolithic Jewish community." Again, Mr. Greenfield, you are far smarter than that. Jews in this country vote overwhelmingly Democrat and are the biggest donors for the party, you know that, I know that, everybody know that. 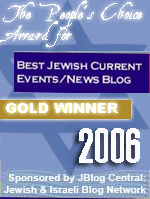 Granted, the American Jewry has been envolved in right wing politics and policies in the past decades but even in these cases what we have from their part is not Conservatism, it is Neoconservatism, for which what really matters is what is good for Isreal and (supposedly) for the American Jewry. So the non-Jewish left is the visible but unimportant face of the left, but the Jewish left are the essential core. That's a convenient rationalization to dismiss Ted Kennedy as an irrelevant pawn of the Jews. If you want to believe things like that, go ahead, but don't expect me to devote time to debating the vast Jewish conspiracy. In the real world, there are progressives and traditionalists who are internally and externally in conflict. That conflict exists within every group. To believe otherwise you're forced to make some irrational claims. 1. You claim to be a longtime reader of the blog, and you claim that I don't attack liberal Jews. 2. You have to claim that the Jewish community is a monolithic entity, while at the same time being a long-time reader of a right-wing Jewish blog. You need to believe that the core of the problem is a united Jewish effort and to believe that you have to disregard all other facts. That's fine. It's certainly convenient to believe that the problem is a purely external one embedded in a few million Jews. Get rid of the Jews and you get rid of the problem. Doesn't actually work but it certainly is comforting to think that way. The European right has less room for such intellectual laziness. But the American far right can still clutch its Jewish security blanket for a few more years. This article is slightly off from your usual excellent analysis. The most important point that you seem to have missed is tha the Arab birth rate is plummeting, and the Jewish birth rate rising, including among the non-religious. (see http://www.theettingerreport.com/Demographic-Scare.aspx). Also you fail to mention that the stranglehold the left has (or has had until recently) on the country is mainly via the media, (now threatened by the Internet and Yisrael Hayom). Mr anonymous is a long time regular reader.. sure right. Not. More like a provocateur. He wants to lump all Jews into one corner. It's the way of the biased. 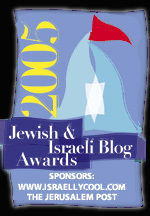 Long time readers will know that liberal Jews get a thrashing on this blog. The "Anonymous" commenter here isn't a Jew. Were he a Jew, he would have understood that the 1965 Immigration Act was not only the opposite of a disaster for America, as it opened the doors for huge numbers of motivated immigrants from Asia who have transformed America, but that it also repealed the racist Johnson-Reed Act that had instituted such tiny quotas for Eastern Europe that Six Million of our brothers had nowhere to turn. "Anonymous" would have turned away Jews as illegal immigrants. Shame! And the "Mexicans, Haitians, Pakistanis and Kenyans" who immigrate to the US aren't a "morass" but people struggling to make it in a new country -- and largely succeeding. I live in a city where 3 out of every 8 residents was born outside the US and it works. Bigots can't accept that. And Ted Kennedy was a strong supporter of Israel and of Jewish causes for his entire political career. As was his brother Robert, who was one of the first American victims of Palestinian terrorism. "the American far right can still clutch its Jewish security blanket for a few more years"
The only popular right wing figure among young Americans today is unfortunately Ron Paul, who is probably the only politician in Washington -- Left or Right -- who actually hates Israel. This is not good. One wonders how redirecting immigration away from countries where Jews actually live to countries where polls repeatedly show anti-semites live is of great benefit to Jews. The kind of young people, Ron Paul is popular among have more in common with the left than the right. Many of them are on the left. The biggest paradox for me is that, for a party called "Labour" (avodah), its voting base is composed by upper-middle-class ashkenazi white collar secular liberals ! It's the bourgeois elite of the country ! (exactly like american jews)While the mizrahi working class is conservative and traditional, the opposite of the left !